We appreciated the new perspective that Sarah brought to today’s show! Even if you don’t have your sights set on celebrities, her tips are great for any business owner wanting to grow through influencers. 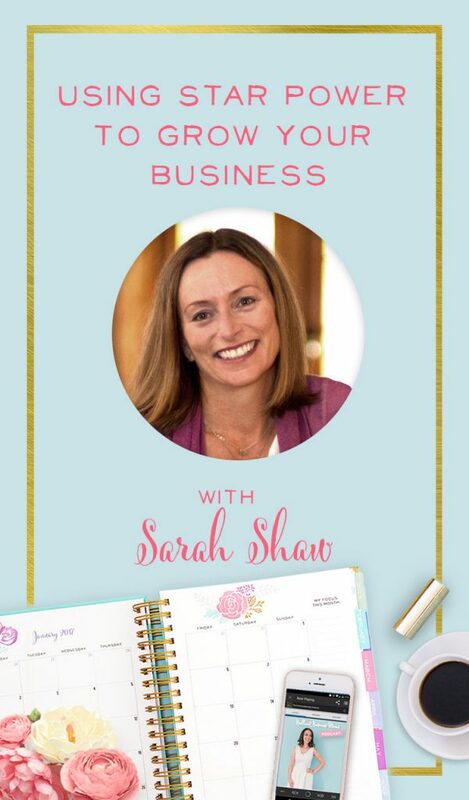 Sarah Shaw is a 3rd generation entrepreneur, and she has done it all. She’s worked in the film industry, had a successful handbag business, and is particularly skilled at reaching out to celebrities to get her products more recognition and make more sales. She now teaches others how to do just that at sarahshawconsulting.com. In addition to all of this, she’s a single mom to 9-year-old identical twin girls. 10:15 – How Do You Even Get A Celebrity’s Address!? She started her handbag company on a whim while working in the film business, doing costumes for movies. She had this random idea, which surprised her because she never thought she’d be an entrepreneur. “I am a third generation entrepreneur, but I thought no way would that life be for me! I want a steady paycheck and retirement!” Sarah rememebers. But when small business is in your DNA, it’s hard to fight. Sarah worked on this handbag idea during her nights and weekends, shuffling around her schedule to do it. She asked everyone she had ever met in her life for help. It felt a bit dumb, but she didn’t let the feeling deter her from trying. One of her big, early mistakes was that she didn’t have any insights on figuring out pricing structure. When you have a product-based business and are laying out money to create your items, if you’re not correctly pricing your work you’ll go out of business fast. Service-based businesses have it a bit easier in terms of pricing. Their ROI is generally higher, and oftentimes the startup costs aren’t as steep. As her business grew, Sarah knew she had to get on top of pricing. Let’s say a bag cost her $25 to make. She might be selling those wholesale at $50, while a store sold it for $100. She didn’t know how markups worked and her numbers didn’t add up. When she would sell bags person-to-person, she would maybe sell a bag for $30 or $40 and feel good about it because she just wanted her money back. Profitability was not on her mind, and it would have driven her out of business if she didn’t realize her pricing structure wasn't sustainable. The one business aspect she totally DID get right off the bat was marketing. She wasn’t afraid to ask people, even those she didn't know well, if they wanted to buy her bags. Then, friends of friends started asking for a Sarah Shaw Handbag and word spread around LA. Some of Sarah’s friends worked on movie or television sets, and she asked if she could set up a table of her handbags at lunch. She sold a few more bags this way. Over dinner one night, a costume designer friend of Sarah’s was lamenting the fact that she had to outfit Donald Sutherland in only Donna Karan clothes. (Donna Karan was a big name designer in the late 1990s.) Then Sarah had a lightbulb moment: I can get my products to celebrities and let them market for me! Before the age of social media, what a brilliant way to get your product in front of more eyes! About 5 to 6 months after sending those initial bags, Sarah had an unexpected payoff when Liv Tyler showed up on the pages of InStyle magazine holding one of her bags she had sent over months and months earlier. Another day Sarah was waiting in an office and flipped open US Weekly to find Kristen Davis carrying one of her bags, too! At that point, Sarah “started sending those pictures to magazines, mentioning the celebrity holding her product, and they started writing about it. Not many people were seeding celebrities with products at that time, but it seemed logical” to Sarah. She was a pioneer in that field. After that, her business took off! She got her bags to over 70 A-List celebrities. She made bags specifically for Julia Roberts in Oceans 11 and America’s Sweethearts. Those bags were purchased by Bergdorf Goodman and Sundance Catalogue, respectively. In one of her most business-changing connections, Sarah was asked to make a bag for the Legally Blonde movie. Though the bag was never seen in the film, it did make the cut of an advertising poster. Thanks to the publicity, her company went from half a million in sales to a million that year. Nordstrom bought tons of bags, over $150,000 worth. And Sony Pictures was so excited about it that they sent over mini movie posters to include in each bag. Sarah appeared on E! Entertainment and Access Hollywood. She found that success really builds on itself. Sarah is grateful for this unique way to have her product validated: “You need to make sure you have something to keep you going, and to know that you have something more than just you and your mom think is cute!” And Sarah’s celebrity endorsements certainly prove that. How Do You Even Get A Celebrity’s Address!? We had to ask, how do you even go about getting the address of a celebrity!? Sarah’s business started before internet use really took off. Back then, she just called up agencies to ask who represented So-and-So. Sometimes she would write a letter or send the product with a note, “Could you please get this to Sarah Jessica Parker?” But there was no way to verify if her bag got into the hands of the celeb. Now, Sarah recommends using ContactAnyCelebrity.com. This site has contact information for pretty much any famous person on the planet. A lot of moms listening are thinking that it would be a dream come true for a big store to place orders for their products! Does Sarah have tips to help make sure this mega-business dream would work out? Is it even profitable? Sarah strongly cautions mompreneurs to take any relationship with department stores very slowly, saying, “They’re not always your best friend. They could love you today and hate you tomorrow.” And one return of a mass order from a department store could easily bankrupt your business. Sarah recommends getting a solid base of small stores (think boutiques and shops) who actually know and support you first. Then you could turn to department or mass market stores (think Costco and Target). Really think about working with those bigger retailers as icing on the cake. Sarah explained that these days, most stores work essentially on consignment – though it’s more complicated than that. Usually, in the small print, they’ll have language referring to either a 30, 60 or 90-day period after which all of your products would get returned if they don’t sell. For moms who do want to pursue bigger stores, Sarah recommends you test the waters first. Either suggest or agree to a small test run of products before going big time. She says most stores will want to start small anyway, but really encourage it – and be thrilled with the chance, since, as she says, “If it doesn’t go well, it won’t be a financial disaster.” (Hard words to hear, but true.) Picture a store chain with 80 to 90 stores. You might suggest testing your product in their top 10 stores first. Bottom line: you know your products best, and send what you know will work. You’re the expert on your product! Her wisdom was SO good and applies to lots of areas of business. One of Sarah’s businesses made an impressive $500,000 in sales during her first 2 years, with just one patented product! “I’m kinda an animal when it comes to business!” Sarah says. She had lots of investors in her handbag company but had to close the business in 2002 when she lost most of her investors after 9/11. She hobbled along in business for a while but realized she couldn’t function without that investor money. She tried a few ideas but realized how much she didn’t know about running a business. With Sarah Shaw Handbags, a lot of her day-to-day operations were hired out. So she started teaching herself Photoshop, email marketing, and website building. But none of those handbag reps wanted her new product. And she set out on a mission. The business snowballed from there. Much like her handbags, she got the product to media outlets and to celebs. She even made custom handbag hangers for Jennifer Aniston! She also scored a magazine feature in Redbook and sold about 900 hangers after that. Sarah said that living in Los Angeles it's easy get lost in celebrity magazines – like Marie Clarie and Harper’s Bazaar – and forget about the other magazines that actually have some of the largest reaches in the country. Sarah has carved out a real space in the marketplace for herself, getting businesses owners connected with celebrities to promote their products. I had to ask if she could give us specific advice on how other women in business can reach out to celebs and actually get noticed by getting products into the right hands. Know your customer base and which celebs would resonate with them. If you go after Celebrity A but they don't necessarily care about her, no matter how much you push it the news will fall flat because they like Celebrity B better. You really want a return for all this effort! Be clear about why you’re getting your particular product or service to THAT particular celeb. When you find that perfect celebrity, reach out to them and write an honest note about why you want to send them your product. Most of the time celebrities are happy to receive the offer; it’s rare that you’ll get a no. Follow up with the agent or publicists to ensure that the celebrity has received your product. Or, you could write to various bloggers with the same news. The blogger may not necessarily be interested in finding and featuring celebs, but the news that your product is in the hands of an A-lister may give you credibility! If ever you do spot your item in the same picture as a celebrity, Sarah says it’s important to act fast on the news! You want to really publicize the moment. But if you’re worried about not being able to meet demand, you can simply write a note in your shop that, “Because this item was featured in People Magazine, it’s on backorder until blah blah date.” Don’t worry about the windfall, just take it as it comes! I thought her comments about how to handle an unexpected windfall was SUCH a good point! I did something similar with a product in which I did a Kickstarter. I did pre-orders and was able to then go place the big order with my manufacturer knowing I already had sales. It makes sense that if you get a ton of unexpected traffic because of a celebrity being seen with your product, use the momentum to take the pre-orders or backorders, whatever you call it! That way, you have the cash to make the product. Or if you’re a handmade business, now you have the cash to find your assistant to help you produce more product. Blindly calling stores can be really scary! Or maybe you’ve loved a celeb since you were five and are trying to send them a free product. It can be intimidating. What you need is to boost your confidence. Celebrities aren’t any different from other people! Store buyers aren’t better than you and don’t know more than you. They’re all normal people with a job that makes them famous. We all know their face, but not really them. And of course, it is exactly being in the public eye that makes celebrity attention so valuable – but it’s good to keep this all in perspective. Sarah has identical twin girls. When they were around 3, they were at grandma’s house to celebrate her birthday.